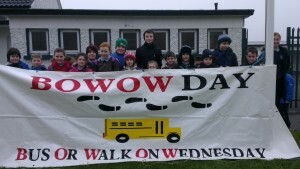 "Bus Or Walk On Wednesday"
The 4th Green Flag is on the theme of Travel. "But what is B.O.W.O.W. all about???" We all have a dependency on our cars. Many children are driven to school when perhaps it may be possible to come in another way... walking. Each fortnight on a Wednesday, children are encouraged to come to school in a more environmentally-friendly way. 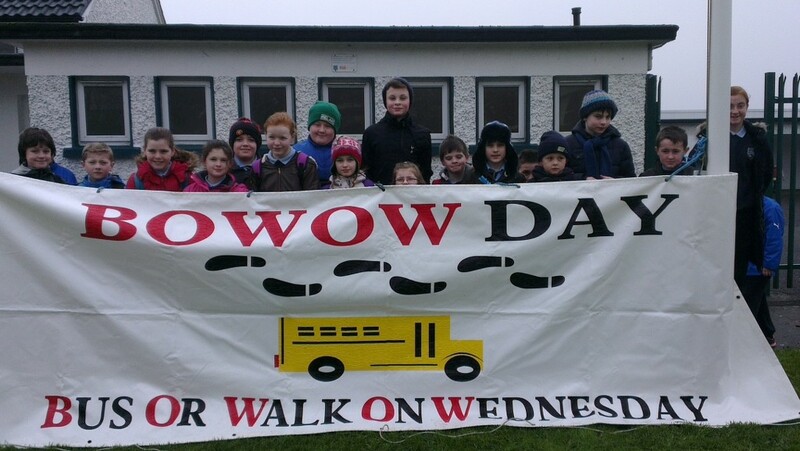 Walking buses are organised by parents and 'pick-up' children along pre-determined routes and bring them to school. It is! Children and parents have been great to support the initiative. "What about those that live far away from the school? Do they have to walk too?" It is not possible for everyone to walk to school. It is either too far or too dangerous. In that case, we would encourage people to try car-pooling. Many children come to school on the bus already. If you do come by car, perhaps you could consider stopping off at the church car park and walking the rest of the way with your child/children. For the launch of our initial B.O.W.O.W. 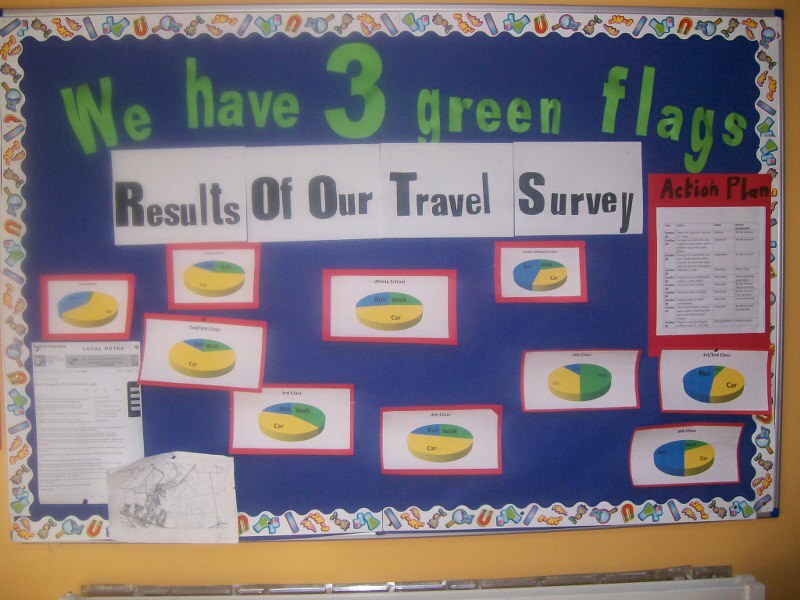 programme, we had a poster/slogan competition to find a new school slogan for our Travel theme. Laura Doonan in 4th class was the overall winner. Our Slogan - "More Footprints Less tyreprints". 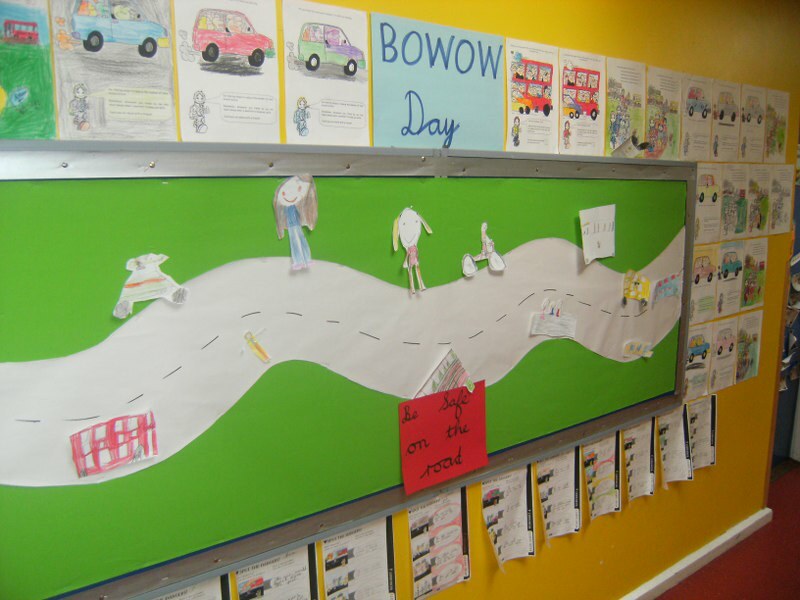 BOWOW Results Wednesday 1st May 2013. It's a BOWOW Record !! Well done everyone !! 11 children came to school by car. 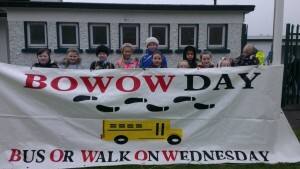 217 children walked to school. 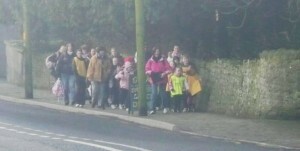 20 children came to school by bus. 7 children cycled to school. BOWOW Results Wednesday 24th April 2013. 41 children came to school by car. 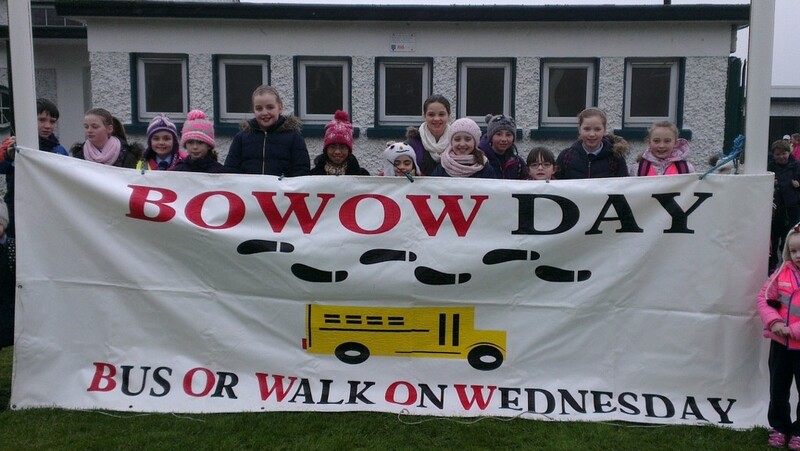 150 children walked to school. 52 children came to school by bus. 2 children cycled to school. 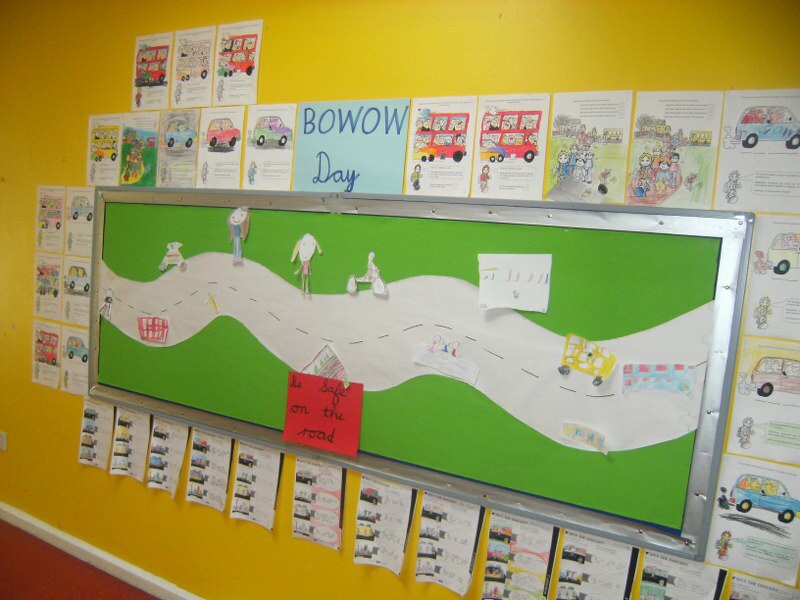 BOWOW Results Wednesday 17th April 2013. 45 children came to school by car. 131 children walked to school. BOWOW Results Wednesday 10th April 2013. 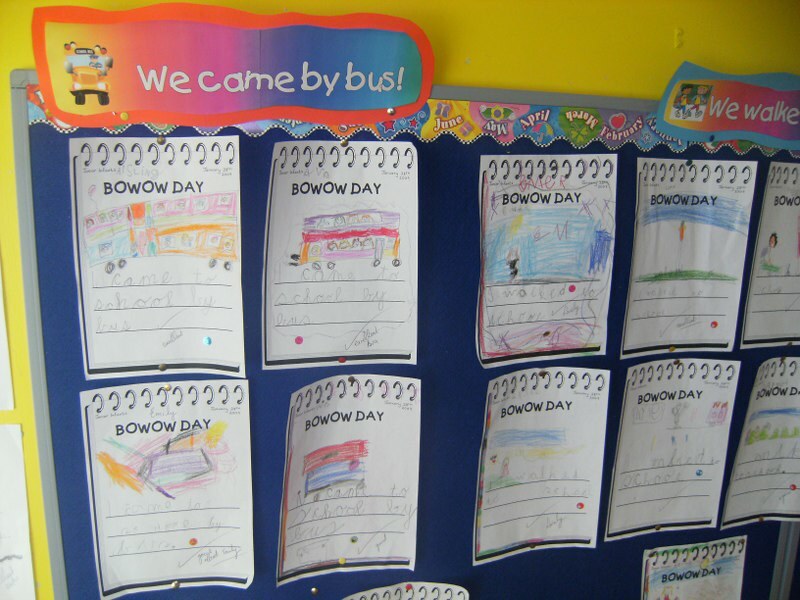 BOWOW Results Wednesday 21st March 2013. 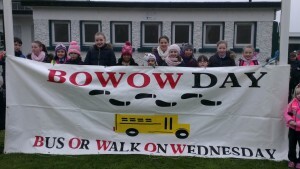 BOWOW Results Wednesday 7th March 2013. 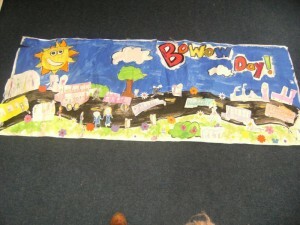 BOWOW Results Wednesday 27 th February 2013. 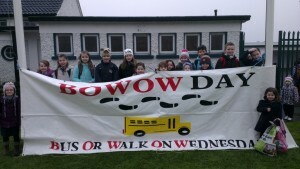 BOWOW Results Wednesday 20th February 2013. Our final BOWOW Day was most definitely a wet one! The heavens opened and gave all those brave souls on bikes a good soaking. It would have to happen on our 'Bling Your Bike' Day! Nevertheless, with so many bikes arriving at school (and a few extra delivered aswell!) there was a great display. While BOWOW Day went ahead this morning, the transport results were not recorded. It was a busy day here today! As mentioned, we are collecting old mobile phones for recycling. This past week we have collected 25. For every 100 mobiles collected, the school will recieve a new computer. If you have old, broken or unwanted phones please send them into the school and we will put them to good use! We are now collecting old mobile phones. If you have an old mobile phone we can have them recycled. More info to come. 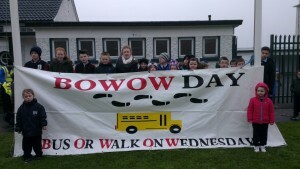 Today was the first BOWOW day of the 3rd term and its great that such a good effort was put in to keep us on track! 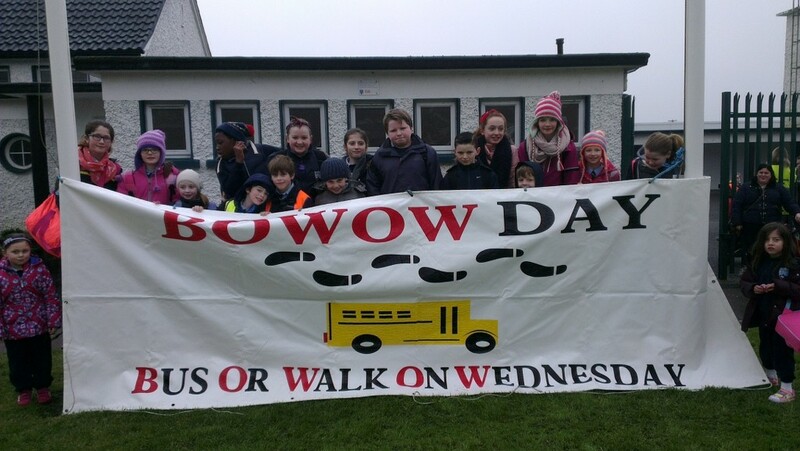 Please note that while next Wednesday is Confirmation Day for the 5th & 6th classes, BOWOW day will still take place. 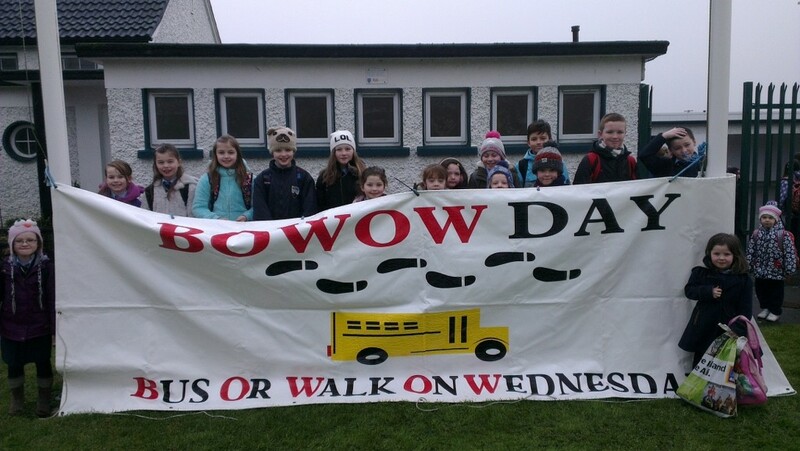 Though today was indeed April Fool's Day, BOWOW day is really going to happen every Wednesday and no-one was fooled into thinking otherwise! This week's Golden Boot competition was a repeat of last week's. 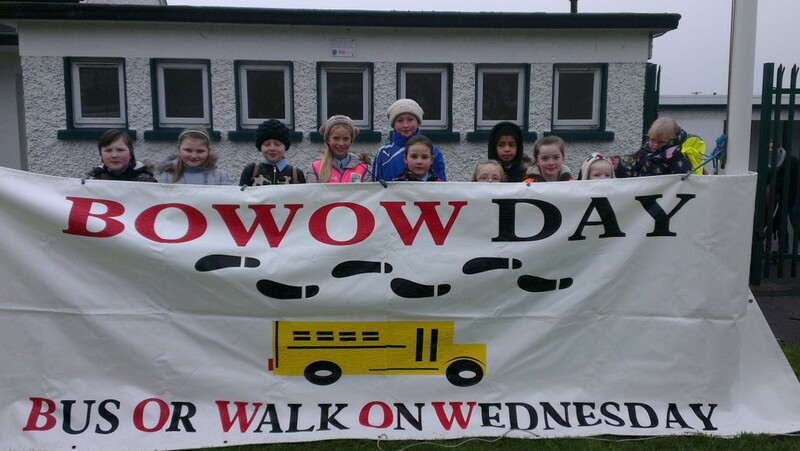 This time, however, the winner's were Ms. Gerrard's Senior Infants and Mr. O'Connor's 5th class. Congratulations to them. The two classes even get to hold onto the trophies for a little longer as next week brings the Easter Holidays! 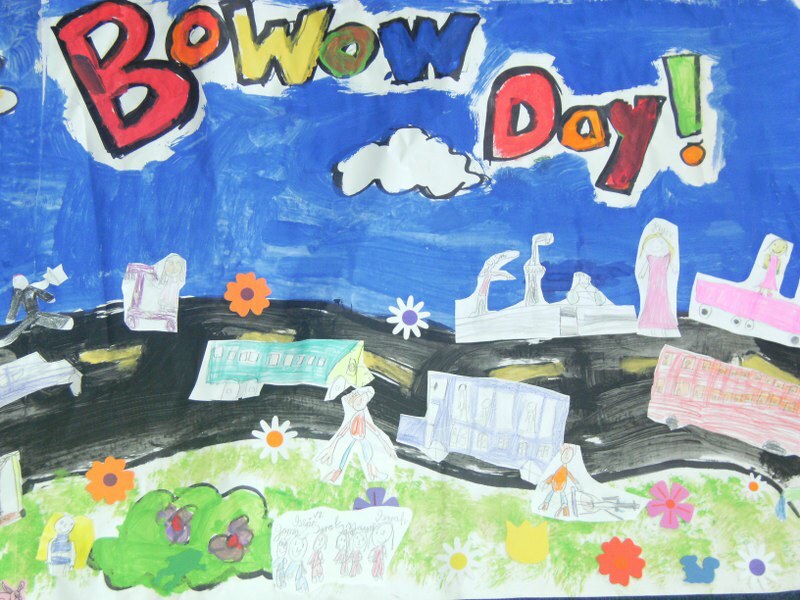 NOTE: As the BOWOW initiative has been so successful, many of the parents have requested that BOWOW day be held each week instead of every fortnight. 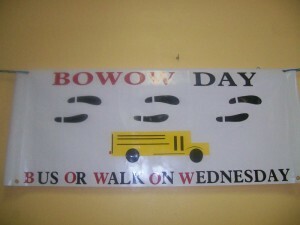 So, starting from next week, BOWOW day will be every Wednesday. This week's Golden Boot competition was about revision of all our ways of staying green. The Green Team performed spot checks around the classrooms to make sure lights were off when not needed, doors closed at lunchtime, picking up rubbish etc. 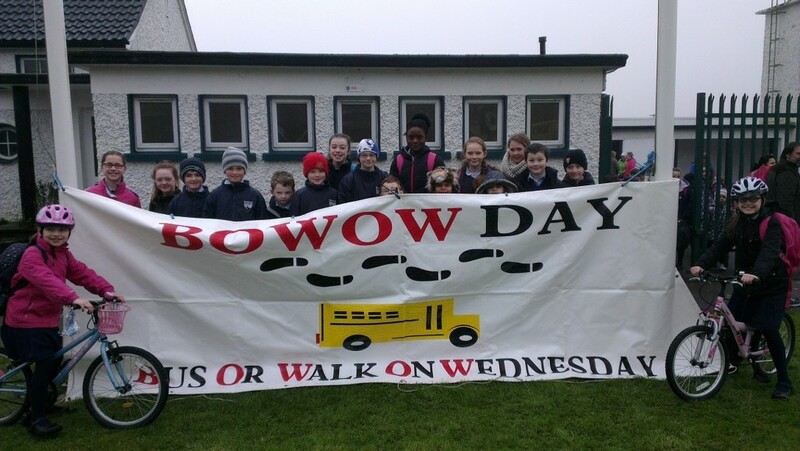 The winners were Mrs. Connor's Senior Infant & 1st class while from the senior end, Ms. Mulqueen's 6th class won. Congratulations to the two classes. For week's competition, the children had to design a shoe suitable for walking. Todays competition was for the best poem/limerick written about the travel theme. Some classes got together and wrote a class poem/limerick, others worked in groups while others worked individually. 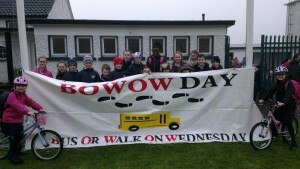 This winners of this weeks Golden Shoe Award was Ms Mulligans classroom and Ms Browns classroom. 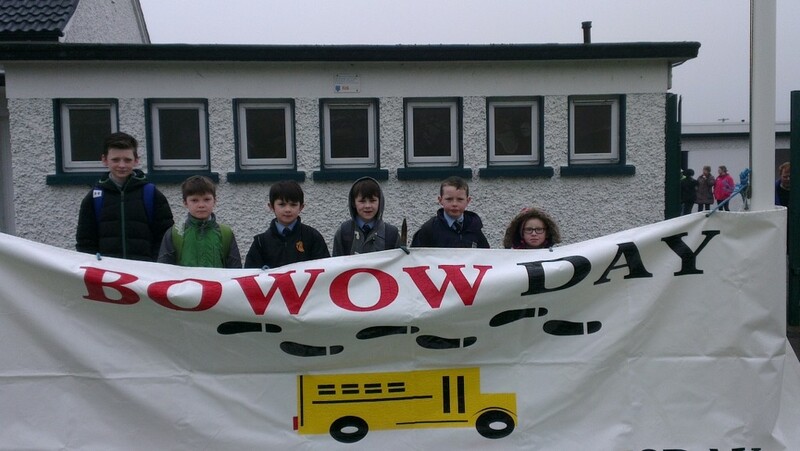 Congratulations to David Kelly in 3rd class who won the award for Ms Brown's room and David King, Eva Salerno and Jonathan Mc Donagh who wrote the winning entry in Ms Mulligan's Classroom. On each Bowow day, a new competition is announced. 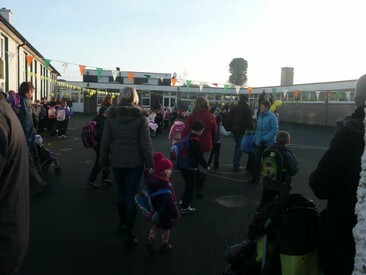 The competition is open to all classes from Junior Infants to Sixth class. 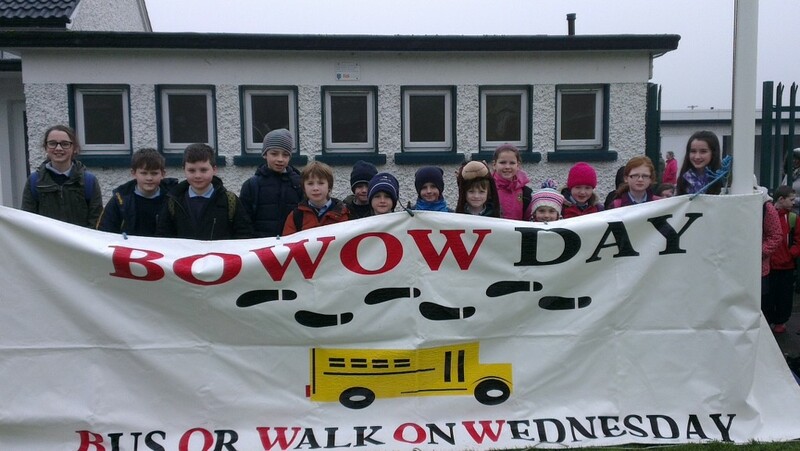 There are two winning classrooms each fortnight, a class from the Junior end of the school - (Junior Infants - 2nd class) and a class from the Senior end of the school - (3rd - 6th class). 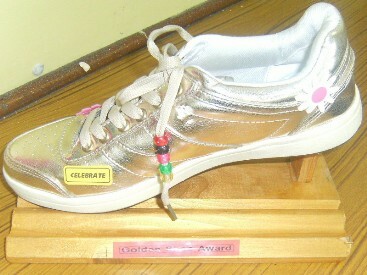 The first two classes to receive the Golden Shoe Award were Ms O' Briens 1st and 2nd class and Mr Sheridan's 4th class. It was a song contest. 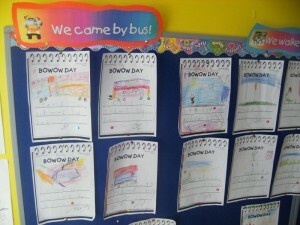 Each classroom had to write and perform a song about our BOWOW day. The tricky part was that everybody's song had to include our slogan in the lyrics.All entries were of a very high standard. Congratulations to all the classes and especially to the two classes that won the award.